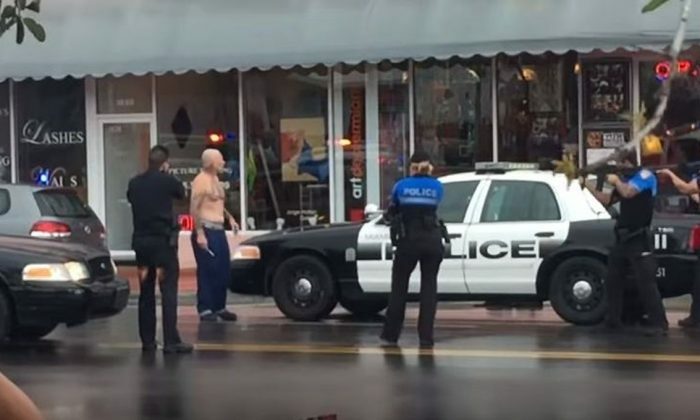 A video shows police officers in Miami Beach, Florida, fatally shooting a man armed with a straight razor. The incident, which took place Saturday on Alton Road in Miami Beach, involved a bank robbery suspect, NBC Miami reported. Police officials got a 911 call for a holdup alarm at a Bank of America. The caller said the suspect was armed with a bomb and passed a note to the teller, which was released by the FBI. He also said he would shoot a customer. The suspect fled the bank and officers later encountered him entering a barber shop nearby. “My understanding is that he did not get any proceeds; he left without the money,” Miami Beach police Chief Daniel Oates told NBC. He refused to exit the barbershop before coming out with a straight razor. Officers fired shots at him and he was killed on the scene. “It’s a horrible, an isolated incident and it’s tragic for everybody involved,” Mayor Philip Levine told CNN. Oates said the man raised a razor in his hand during the confrontation, prompting officers to shot him. “He was challenged by the officers in the street and at some point during that confrontation he did raise his hand with a straight-edge razor in it and he was shot,” he added. Marcellus Johnson, who took the video and posted it on Instagram, said he was getting coffee when he saw the incident go down.